Adventure awaits you at this 3-bedroom, 1.5-bathroom vacation rental cabin in the White Mountains of New Hampshire! 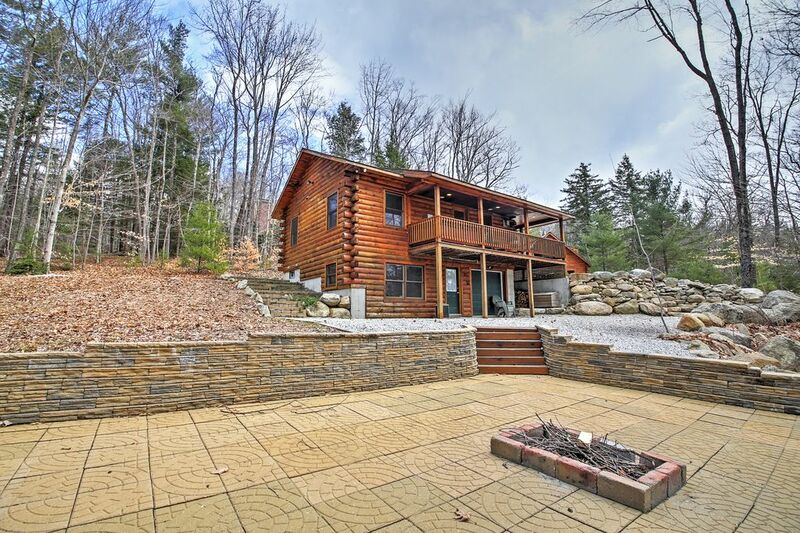 Featuring accommodations for up to 8, a private hot tub, peaceful woodland scenery, and close proximity to North Conway's finest attractions, this home is the perfect getaway for your mountain retreat! Boasting 1,500 square feet of wonderfully appointed living space, this rustically charming log cabin comes equipped with all of the modern touches you would expect from a high-end vacation rental, making it the perfect setting for your White Mountain getaway. Surrounded by mature trees, the foliage around this property presents an ever-changing show of flora and colors, and the large wraparound porch will serve as your front row seat! A private Jacuzzi tub is also sure to please, as it provides the perfect relaxation spot after a long day on the slopes. Enjoy your beautiful surroundings from the spacious outdoor patio with a grill. Throughout the interior of the cabin, natural wood, reminiscent of the gorgeous surroundings, is omnipresent in every room. The fully equipped kitchen features high-end, stainless appliances and stone countertops, further contributing to the cabin's rustic luxury. The living room features a flat screen TV and a fireplace, making it the ideal place to unwind with your companions on leisurely evenings. Other comforts of home include wireless internet access, a fire pit, a finished basement, and an on-site washer and dryer for your laundry needs. Nestled into the quaint beauty of the White Mountains, yet amazingly close to North Conway's finest attractions, this home truly gives you the best of both worlds! Not only is the property close to the 4-season village of North Conway, but it is also within 1.5 miles of shopping, skiing, restaurants, hiking, bike trails, Echo Lake and Saco River! For winter adventures, Attitash Mountain Resort and Ski Area are also very close by! During the summer months, Attitash Mountain Resort turns the ski slopes into hiking and mountain biking trails. For boating, canoeing, and kayaking, head to Echo Lake and Saco River! A number of unique shops and delicious restaurants line White Mountain Road, North Conway's Main Street, which you can reach within minutes of leaving your door. Whether you spend most of your time relaxing in the serenity of the cabin property or exploring the surrounding areas, you're bound to have an unforgettable getaway while staying at this fantastic vacation rental cabin! - Amenities include a fully equipped kitchenette, private hot tub, wraparound porch, outdoor patio with grill, fire pit, fireplace (seasonal), in-unit laundry machines, cable TV, wireless internet access and more! - Outstanding location - Close to the village of North Conway, shopping, skiing, Echo Lake, Saco River, and numerous other attractions! It doesn’t get much better than a winter’s stay at this cozy log cabin. It was very clean and well-maintained - you can tell that the owners put a lot of thought and care into the place. It is one of the best appointed rentals I’ve ever stayed in - we didn’t miss a thing. The downstairs bedroom, bunk beds and sitting area are a nice option for the kids, while the two upstairs bedrooms are small but comfortable. We did not use the hot tub, but it looked inviting. We got snow one morning and a plow was out right away and did a thorough job on the driveway. There are trails right outside the house where you can hike or snowshoe. It’s only a couple of minutes from town, big box stores, and outlets. The house is definitely cozy and decorated beautifully. The on demand fireplace that is hooked up through its own thermostat is a wonderful feature. The home does look bigger in the pictures but had enough sleeping space for 8 adults (2 couples, 2 bunk beds, another bed and a futon). The patio and deck are beautiful and great to sit and drink your coffee on in the morning. I would recommend this home to people looking for a relaxing home base. The hot tub is more of a Jacuzzi outside and tight for more than 2-3 people. Beautiful home in a quiet setting! This home was immaculate! It had everything we needed (towels, linens, toiletries), and the extra amenities were amazing (hot tub, wrap around porch, fire pit). The home was cleaned to perfection, and the modern kitchen was amazing to cook in. We truly appreciated the overall "homey" feel, and especially all of the bear decor! We will definitely stay here again, and make this our regular North Conway stay destination! It was very nice, we all felt right at home. Everything was clean and comfortable. Perfect for our family, enough room for everyone. We loved the jacuzzi and fire pit. My family and in-laws had a great midweek stay at this great log cabin up near the woods by close to North Conway center. We enjoyed the beautiful surroundings and the great hot tub on the wrap around porch. We made some great meals in the well supplied kitchen. Overall an excellent time was had by everyone. Thanks again Brian and David for opening your house to us. We stayed here for 3 nights and thoroughly enjoyed our stay. Ages 2- 62. All loved it! The property is in great condition. Well equipped, everything works. You have the feeling of a log cabin in the woods but with all the amenities. Whether you are there for outdoor activities, outlet shopping, or family attractions- everything is within a short drive. I had a few questions about logistics and Brian, one of the owners, was extremely helpful and pleasant. The owners’ pride in this property is apparent throughout. I would definitely stay here again if our travels take us to North Conway.